Miriam came home from school absolutely crushed due to some friend problems at school (which are now "fixed" because her friend said she was only "joking" and I honestly don't understand how some people can be so cruel, but Miriam is a very forgiving person and is willing to go back to how things were, which I might take issue with (forgive, yes, but have an honest dialogue about how incredibly hurtful the behaviour was) but we're moving in a few weeks so I don't have to worry about this behaviour turning into an abusive pattern in their friendship). So Benjamin asks, "Why don't you just be popular?" Calling on her knowledge of internet memes, our Meme retorted, "It's not that easy, Ben! 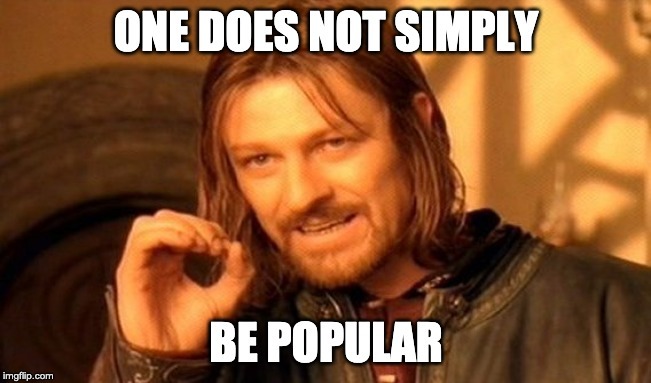 One does not simply be popular." "It's pretty easy for me," Benjamin said. "I'm the most popular kid in my class!" "You are not," Miriam sniffed. "I am!" he insisted. "I'm the most popular for being off-task by reading when I should be listening." "That's...not...what popular means," Miriam said, suddenly starting to cheer up. Alexander calls Andrew "Daddy," which, as a multisyllabic word, is a rather high honour considering nine short long (very long, very exhausting) months ago Alexander decided he didn't like anyone but Mommy. He now will (sometimes) choose to go to Andrew and will allow him to do things like change his diaper and get him ready for bed (without screaming through the entire process). Thinking about how nice it is to be able to pass Alexander off sometimes almost makes me choke up, which means the last several months of being The Most Loved Person in Alexander's world hasn't been entirely easy. He's still incredibly clingy and hardly lets me get anything done with his constant desire to be held. But, I think we'll make it through this season of life. My current worry is how we're going to get Benjamin through his phase. It's a doozy. Whenever he gets caught doing anything naughty he just shrugs and says, "I was tempted," a classic the-devil-made-me-do-it-move. The problem is that he is tempted a lot and I just can't keep my cool through all of it. Today he was wild after school, as he usually is, and he ended up spilling pretzels all over the kitchen. And I mean all over the kitchen. So just imagine the few pretzels you're imagining because you're sure I'm over-exaggerating, and then multiply that several times and spread it all over the kitchen and there you'll have it. I heard the mess happen and could tell it was an extensive one, but I was upstairs nursing Alexander (who—have I mentioned?—is one clingy, demanding baby) so I decided I'd sit this one out. 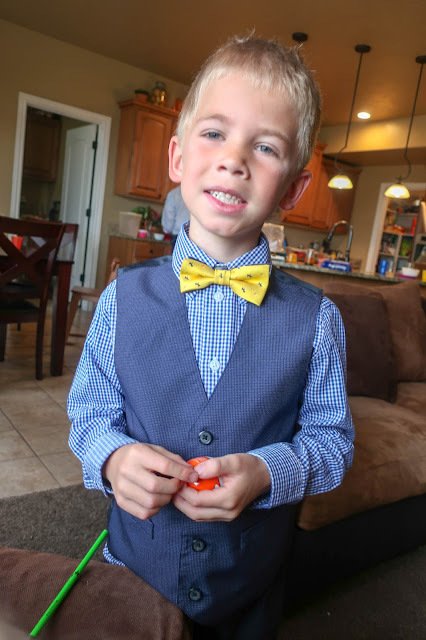 Benjamin is nearly seven years old. That's plenty old enough to know how to tidy up a kitchen mess of their own creation. "What happened?" I called down the stairs. "Spilled some pretzels!" Benjamin called up to me. "Pick them up," I called back down. "I will!" he assured me. But when I went downstairs to check I found pretzels all over creation. 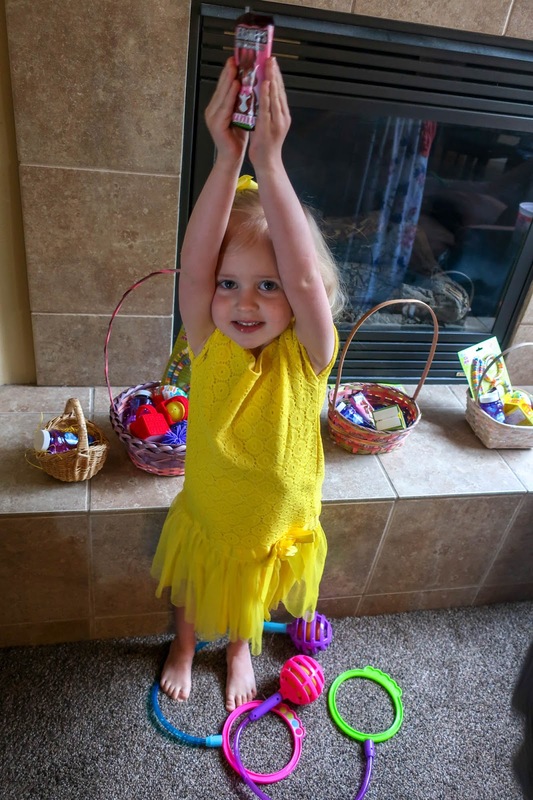 The kids were excited to find their baskets on Easter morning, though they were good little children and waited to get into them until I came downstairs (the very last person of all). Andrew came home from church after sacrament meeting since Alexander wasn't well enough to go to nursery (no symptoms other than the fact that he's running a fever—of 104°F, so, a pretty obvious fever) so while the rest of us were in Sunday School discussing Easter, Andrew was at home taking care of baby, doing dinner prep, and hiding Easter eggs in the backyard. I was hoping for a beautiful spring day for our Easter dinner so that we could eat outside and play yard games, but instead we were due for a big rainstorm. We quickly had our Easter egg hunt before the deluge, and then we tried to round the kids up to take a pretty Easter picture. But the baby was dressed down to his diaper (because Andrew gave him a banana for a snack) and the kids' mouths were all full of candy and they were much more interested in checking out their eggs than they were smiling at the camera, and Zoë had had a chocolate cupcake in Sunbeams and we forgot to wash off her mouth before taking pictures. 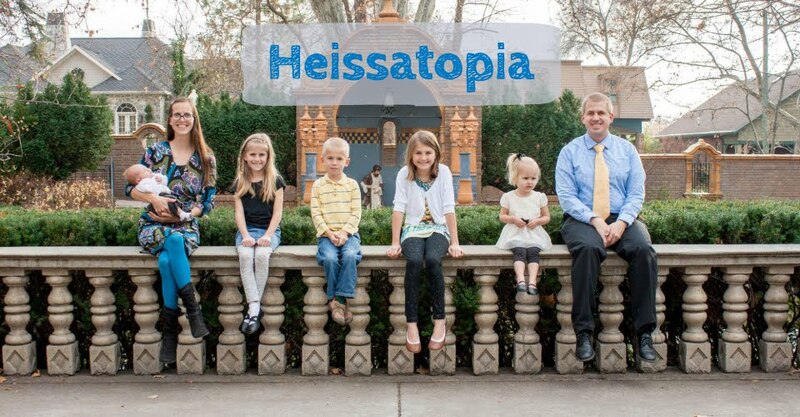 But I still think they're beautiful people because they're my people. 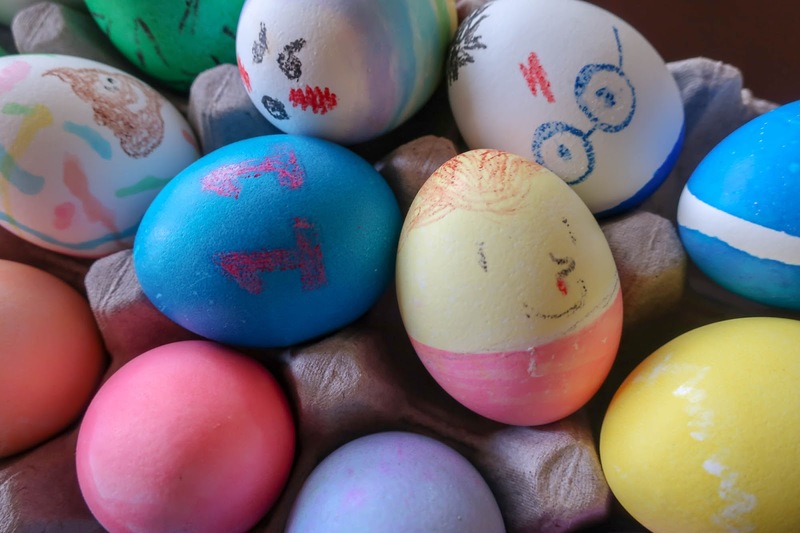 We dyed about a million eggs (okay, only sixty) in preparation for this year's Easter Egg Smackdown. 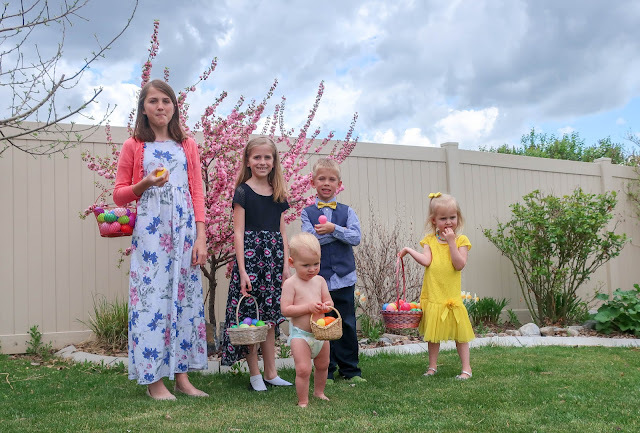 As Andrew pointed out, everyone quite enjoys deviled eggs, so eating that many hard boiled eggs shouldn't be terribly difficult for a family our size. Plus, we all had so many ideas for decorating eggs this year! We could hardly contain ourselves. Any idea someone thought of was immediately countered by another, usually involving a pun. 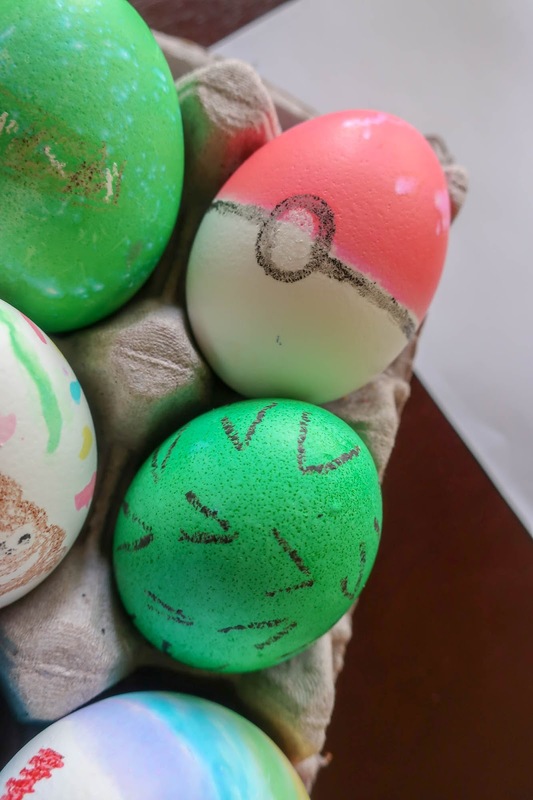 I decided to make a Pokeball, for example, and the next thing I know, Rachel's drawing spikes on an egg to make a "poky ball." Then she decorated an egg as Eleven (from Stranger Things) so I decorated an egg with an eleven. 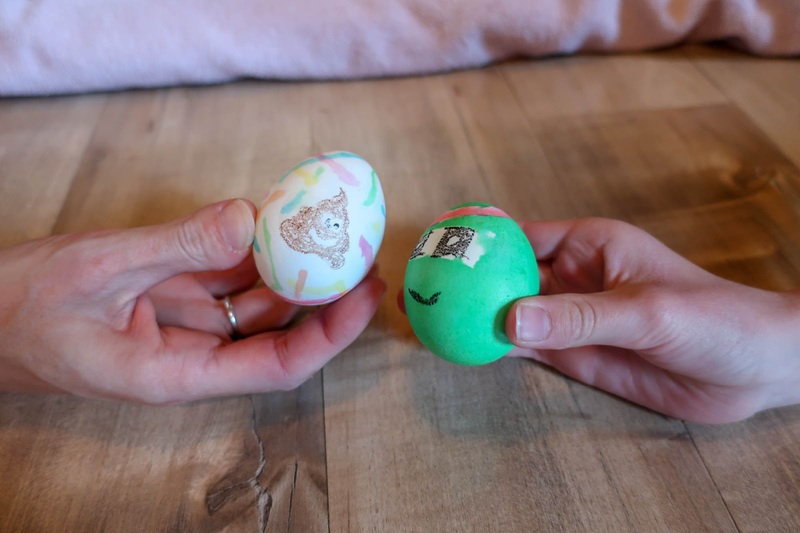 And then Miriam made a Teenage Mutant Ninja Turtle egg and Rachel made a crass joke about making a turd-le egg (which is a word we don't ordinarily use in this household, but for the sake of a good pun we're willing to look past a whole slew of things) and so...I made a rainbow poop emoji egg. 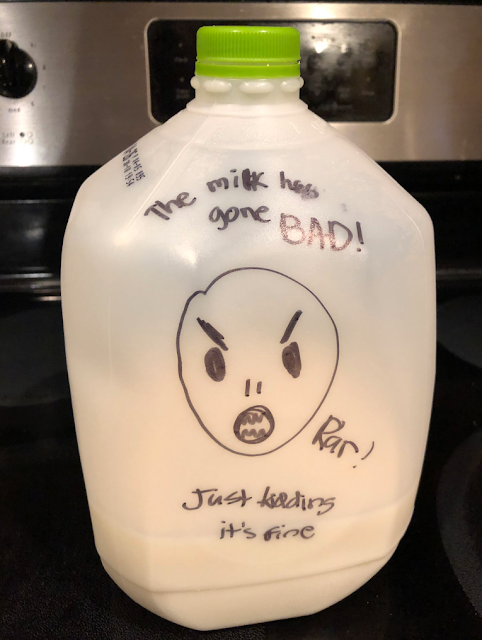 "The milk has gone BAD!" she wrote, with an angry alien face roaring with...dismay...or...rage. But at the bottom she wrote, "Just kidding. It's fine." And then she put it back into the fridge. Now that my class is just about over, I'll hopefully be writing here more regularly again. But, then again, perhaps not because I still have a house to buy and a cross-country move to make (which isn't remotely preoccupying, uh-uh, not at all). This week we've been dealing with sick kids. Zoë and Miriam were both down on Thursday/Friday with fevers. Though Miriam has a slight cough, Zoë has no other symptoms. They were both better on Saturday (or at least well enough for Miriam to go out to the movies with Naanii and Bumpa (they took the three oldest kids to see Shazam). Zoë napped for about six hours on Thursday. She took a morning nap and she took an afternoon nap and she went to bed early. It would have been wonderful if it hadn't been so sad. Alexander was rather the opposite. He woke up with a high fever around 10:30 last night and I didn't get him back in bed until well past midnight. Then he was up and cranky several times before morning. I struggled to get him down for an afternoon nap. And I just now got him to sleep. That poor boy nursed so long he was sloshing when I put him into his crib. And then he spat up, which has hasn't done for a long time. Clearly he overate. But also he wouldn't stop eating! Getting him to bed was rather frustrating today because he (obviously) wouldn't nurse to sleep so then he wanted me to stay with him while he fell asleep, which is fine. I have things to read and I don't mind lying on his floor to read while he falls asleep unless he's going to be doing gymnastics in his crib. My patience wears thin really fast when I'm sitting there, waiting in good faith for that sweet child (whoever they may be) to fall asleep and they're just goofing off. I mean, if they want to play around in their bed, fine. But don't hold me hostage to it! You want to play in your bed? Great. Fall asleep when you're good and ready and let me move on with my evening. Or... Lie still and quiet while you force me to watch you fall asleep. Hopefully we'll all be healthy soon (I'm sure we will be because this seems to be a fast moving virus). It's the last Wednesday of the semester. Our children are tucked into their beds (with three of the five suffering from mild head trauma; it's fine) and Andrew is on his way home. And I'm just so relieved that the end of the semester is here. I suppose I should explain that head trauma before we go much farther. Grandpa and I tag-teamed a buttermilk pancake dinner (I made the batter, he cooked them up), then sent Miriam off to Activity Days. The remaining kids and I walked down to the train park to toss around a frisbee. It was rather windy, as it often is here, and the wind kept grabbing our hot pink disc and whirling it up ridiculously high into the air (which was fine because our playing "field" is a little bowl—with hills on all sides—so the frisbee couldn't get too far away). I spotted Alexander heading for a discarded juice box that I didn't want him to play with, so I picked it up and jogged it down to the trashcan (PSA, fellow Americans: you, too, can put trash into the trashcan!). While I was doing that, Rachel tossed the frisbee and Benjamin and Zoë both went for it and collided head-on. They both sat down, howling and holding their heads, and blaming each other for not letting the other have any turns. They both have a little goose egg but were able to calm down fairly quickly and we worked out a turn-taking system and all was well. Soon it was time to head home so that Rachel could head over to the church where the youth were playing flag football for mutual. I assumed Rachel was having fun because she's into that sort of thing. I never was, not really. I was always a...delicate...child. I wasn't prone to illness, I don't think, but I was just...small. Wafer-thin. Gangly. Awkward. Whatever. I didn't excel at team sports. Zoë's Sunbeams teachers told her that Easter was next Sunday, which she passed along to us at the dinner table. "Easter is next week and I'm so excited!" she squealed, squirming in her seat, and bouncing her hands in the air for emphasis. We went to story time at the library on Monday and it was all about bunnies, which I thought Zoë would love—and indeed she seemed to have had a wonderful time! We read bunny stories, we learned a bunny poem, we did some bunny dances, and wrapped everything up by making a little bunny craft—a cute bunny-ear headband! She happily wore it all around the library as we checked out books and visited the play room and took a turn at the iPad station. She kept it on her head all the way home and into the house. And then she said, "Why did we learn about bunnies today? It's not Easter yet. Easter is next week!" "Oh, just to get you excited about Easter, I suppose," I said casually because I thought we were having a casual conversation but apparently we were not. Apparently this was more of an existential matter because the next thing I knew, Zoë had ripped off her bunny-ear headband and had thrown it to the ground. "Well, I was already excited about Easter before any of this stuff happened!" she screamed, stomping on her headband. "Why did she do this to me?!! I don't need bunny ears to tell me I'm excited about Easter!" Talk about evil librarians! What was our sweet story time lady even thinking?! I'm at once relieved and sad to be finished with organ for the semester, which is how I feel about many things in life. I'm relieved because two hours of class each week (plus commute time) was an awfully big commitment for a 9-year-old. We're very lucky Miriam enjoys practicing because otherwise I don't know how she would have made it through this year (I suppose if she didn't enjoy practicing we wouldn't have signed her up)! I suppose I'm the one who is commitment-averse. I always sign my kids up for things and then wince at how much I've committed to (teaching preschool, soccer practice, play practice, organ lessons, etc). I love that they are learning new things but...I'm also tired...so I'm glad that she has her Tuesdays and Thursdays to just come home from school and play in the backyard, rather than rushing right back out the door. But I'm also sad it's over because it's been such a fabulous experience for Miriam! She has loved her teachers and classmates, which is such a blessing because this has been such a difficult year for her at school. 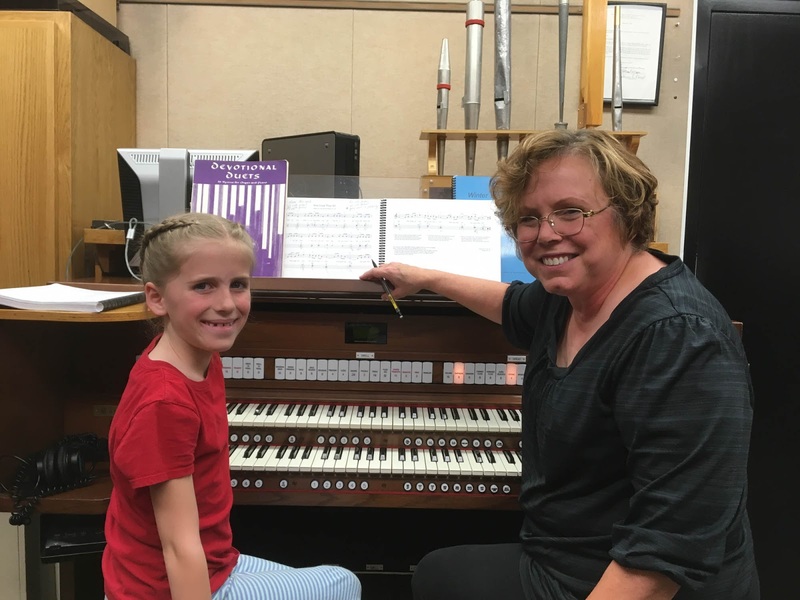 And in the face of that, organ has brought her so much joy! 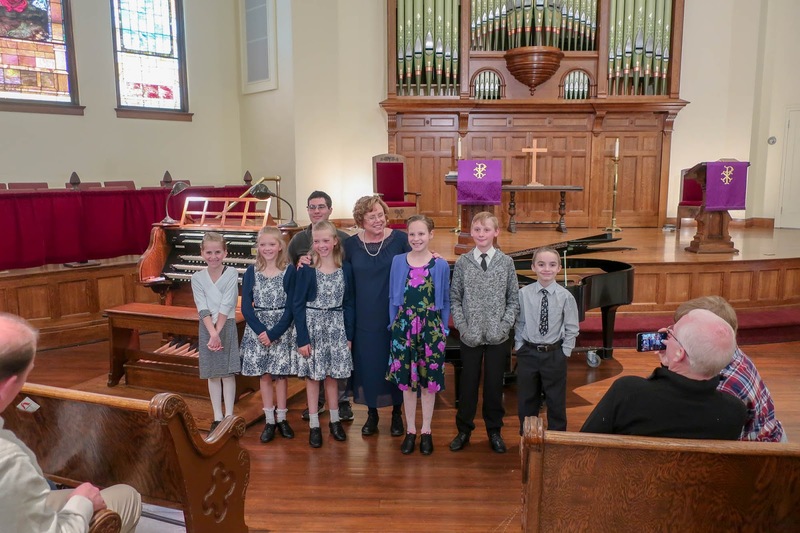 All the kids are just so sweet and they have this shared interest of everything organ, which has helped them be friendly with each other. And it's been so wonderful to have this class not only as a musical outlet for Miriam but as an emotional one as well.